“We don’t have the resources to meet the demand through the public system of care. I wish we did." BESSEMER, Ala. ― Broken. That’s how Trinity McGuffie, 37, would describe how she felt for almost two decades. As she reflects on her past, she twists her hands in her lap. In a quiet, steady voice, she recounts the tumultuous years of her untreated mental illness and drug use. McGuffie started using drugs in 1996, when she was a student at Hayden High School near Birmingham, Alabama. Around that time, she also started experiencing crippling depression. She found herself relying on weed, and eventually crack cocaine, to cope with the symptoms of her deteriorating mental health, which included hallucinations. McGuffie’s hospital stays will sound familiar to many Americans: She received treatment, only to be released a short time later to fight her conditions on her own. Her drug use often meant physicians had a hard time diagnosing her underlying mental health symptoms, unable to distinguish them from the side effects of getting high. It’s not uncommon for someone to live with addiction while also experiencing other mental health issues. Drug abuse can exacerbate one or more symptoms of existing mental illness, and mental health problems can make people more vulnerable to substance dependence. If a patient only comes in when they’re experiencing severe symptoms or they’re unaware they have a mental health issue, it may be more difficult for doctors to treat them. Research shows that it’s more effective to address both drug addiction and other mental health issues at the same time. Yet mental health care is declining nationwide as the rate of mental health diagnoses is increasing. Access to care, lack of health insurance and the financial burden of treatment are all barriers to getting proper help. In Alabama, there are currently only three state-funded psychiatric hospitals. In the 1990s, there were 14. Trinity McGuffie stands outside The Foundry Women's Center. McGuffie had substance abuse disorder and mental health issues for nearly 20 years before she entered The Foundry Ministries' year-long women's recovery program, a faith-based service in Bessemer, Alabama. In 2015, McGuffie finally realized that if she didn’t get clean for good, she’d be permanently under her family’s care. So she entered The Foundry, a Christian substance abuse and mental health recovery center based in Bessemer, 15 miles southwest of Birmingham. The program does not offer medical advice, diagnose participants or administer prescriptions. It provides a year of room and board, a host of social services and daily group sessions that focus on teachings from the Bible. Though faith-based organizations can partner with the medical community to help people with addiction and other mental health issues, they are viewed as separate entities, since religion-based recovery programs typically aren’t clinically tested or sometimes even staffed with doctors. However, some now say that in particularly under-resourced communities, faith-based programs can be a successful supplement to medical care ― and can even help treat spiritual people who might not otherwise seek medical attention. They’re increasingly filling a need in the Birmingham area, where limits to state-funded care mean patients have less access to help when they’re in a crisis. Still, the existence of these faith-based programs shouldn’t detract from the need to expand state-funded treatment facilities and programs, according to Dr. Richard Craig, executive director of the Jefferson-Blount-St. Clair County Mental Health Authority in Birmingham. 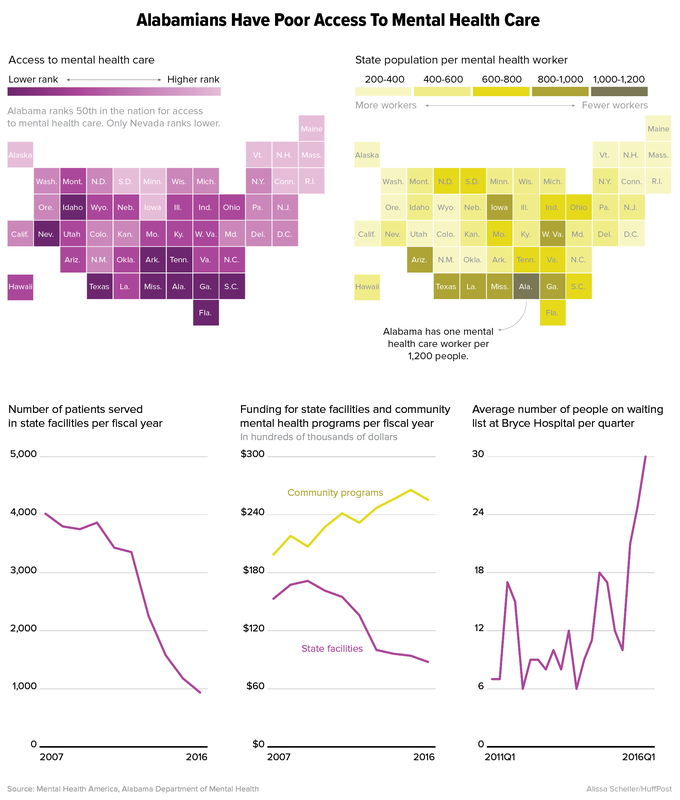 Over the last few years, state-allocated dollars for mental health services have been drastically cut. Part of this has to do with the recession and a drop in tax revenue, according to Craig. From 2008 to 2012, the Alabama Department of Mental Health lost nearly $40 million in state funding. “The state department of mental health did its absolute best to put services in the community to replace what was lost at the institutional level, but we haven’t fully been able to recover,” Craig said. The legislature has tried to allocate more money since 2012, he added, but so far, state funding for mental health care hasn’t significantly increased. A 2016 report shows that Alabama ranks second-to-last in the United States in access to behavioral health care. There’s a glaring shortage of mental health professionals in the state, averaging one worker for every 1,200 people (the national average is about one for every 529 individuals). State-funded psychiatric hospitals are also pushed to the limits. The few available facilities often don’t have enough available beds to care for the number of people who need them. For example, Bryce Hospital in Tuscaloosa is the only existing psychiatric hospital in the Birmingham area. Bryce has 268 slots and they’re often filled, according to Craig. The Foundry has 413 spots. The Foundry’s 12-month mental health support program is also relatively inexpensive ― it costs approximately $1,000, thanks mostly to private funding and church donations. That includes a nine-month residential stay, meals, transportation, religion-based counseling, basic medical and dental care, employment services and continuing assistance for the remainder of the year once participants move out. McGuffie’s experience in the public health system, by contrast, was focused on triage ― not long-term care. Anecdotally speaking, faith is a large part of life in Birmingham. Alabama is also ranked as one of the most religious states in the U.S. It’s something that doesn’t necessarily reflect national trends: The number of Americans who say they reject religious affiliations is on the rise. But, as McGuffie says, scriptures aren’t just words on a page ― they can be considered an outline for how to live your life, even when it comes to dealing with mental health issues. “There’s a wide base of faith and spiritual communities throughout the South, and for many people in those communities, seeking counseling from a faith leader is not uncommon as the first step,” said Dr. Altha Stewart, president-elect of the American Psychiatric Association. Research shows that religion and spirituality can help people cope with major life stressors, including serious mental illness, according to the American Psychiatric Association. In other words, there’s power in believing in a higher power and sometimes, it’s even the starting place for getting help. Christian ministries are not alone in this willingness to incorporate mental health care into their structures. The Muslim community is digging into this problem as well, according to Dr. Farha Abbasi, an assistant professor at Michigan State University and founder of the Muslim Mental Health Conference, a yearly gathering of imams and mental health professionals aiming to better integrate faith and behavioral wellness. The key is arming faith leaders with information about the signs and symptoms of mental illness so they’re able to direct members to medical help if that ends up being necessary, Stewart added. Religious leaders don’t tend to be clinically trained and some may even disapprove of medication or deny the existence of certain conditions. But places like The Foundry and many of the organizations Abbasi helps train are working to create a bridge between medical intervention and faith-based recovery. About two months into McGuffie’s stay at The Foundry, she started hearing voices. She had dealt with hallucinations when she was using drugs, but things had been going relatively well for her at The Foundry until then. The experience was all-consuming, and all of a sudden, she believed everyone around her was out to get her. McGuffie’s mentors at The Foundry got her into the hospital, and she eventually received a proper mental health diagnosis of schizoaffective disorder, a complex mental illness that has elements of schizophrenia, depression and mania. Doctors administered Abilify, a monthly injection-based medication, to address her symptoms. Brandon Lackey is chief program officer at The Foundry Ministries, a Christian nonprofit that provides "rescue, recovery and re-entry” programs for people recovering from substance abuse and living with mental illness. Brandon Lackey, chief program officer at The Foundry, is proud of how the program was able to aid McGuffie in her recovery yet still get her medical help when she needed it. His eyes light up with enthusiasm as he describes how the center can help people seeking a more religious mode of care. The main curriculum for The Foundry’s recovery program is based on the Genesis Process, a Christian recovery workbook and training program written by Michael Dye, a California-based researcher and addiction counselor. The treatment helps people change their behavior by teaching biblical principles and providing cognitive exercises designed to challenge negative thoughts. Lackey acknowledges the drawbacks of solely seeking help from religious organizations. He says it’s vital that people consider this when they come to The Foundry for support. Inside The Foundry Women's Center in Bessemer, Alabama. McGuffie is now sober and managing her mental health. She graduated from The Foundry Women’s Center’s 2015 recovery program and went on to help others who are dealing with mental health issues and substance abuse. She now works as a recovery support specialist at a city-run mental health organization, and shares her story with people who need support. “I really thought I was going to die in my addiction, or that I was going to take my own life ... So I’m glad that I’ve found my purpose,” McGuffie said. She credits her recovery to her experience at The Foundry, adding that the program taught her how to live a productive and fulfilling life. Clarification: Language in the article has been updated to more accurately reflect McGuffie’s current diagnosis.